Prescott passed for 102 yards and two touchdowns, including a 13-yard scoring pass to Dez Bryant early in the fourth quarter that gave Dallas a 17-point advantage. Morris rushed for 126 yards and a touchdown, all but 38 yards coming in the second half. After getting a full practice under his belt on Thursday, the Chicago Bears are hopeful to see linebacker Danny Trevathan back on the field this weekend against the San Francisco 49ers. Trevathan has missed Chicago’s last three games due to a calf strain sustained against the New Orleans Saints. Trevathan started seven games this season for the Bears before the injury sidelined him the last three weeks. Dak Prescott was getting X-rays on his swollen right hand when rookie Ryan Switzer scored his first career touchdown on an 83-yard punt return. The extra time with the Dallas offense on the sideline kept Prescott from missing any plays, and last year&apos;s NFL Offensive Rookie of the Year led the Cowboys to their first win after three straight losses without suspended star running back Ezekiel Elliott. 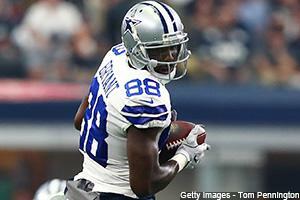 Dallas Cowboys wide receiver Dez Bryant made a major impact in a Week 13 win vs. the Washington Redskins, as his touchdown grab solidified him as the new franchise leader in reception TDs. The Dallas Cowboys defense racked up four sacks and forced four turnovers in a huge win against the Washington Redskins in Week 13. NFL Network&apos;s David Carr and Willie McGinest break down the Dallas Cowboys success on Thursday Night Football against the Washington Redskins. Dallas Cowboys quarterback Dak Prescott talks about the Thursday Night Football victory against divisional rival, the Washington Redskins. Dak Prescott and the Dallas Cowboys finally found a way to win without suspended star running back Ezekiel Elliott. The question is whether the defending NFC East champions figured it out in time to salvage their fading playoff hopes. Prescott threw two touchdown passes, including a franchise record-breaker to Dez Bryant, and the Cowboys beat the Washington Redskins 38-14 on Thursday night. You are currently browsing the Sportspool.com Sports News blog archives for November, 2017.